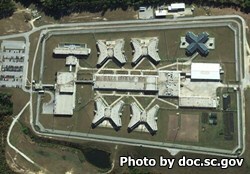 Kershaw Correctional Institution is a medium security prison that houses adult males. The current capacity of Kershaw Correctional Institution is 1,403 inmates. This facility houses inmates in double and triple bunks. Kershaw Correctional Institution offers vocational classes in small engine repair, upholstery, and carpentry. Additionally this institution employs 100 inmates in the correctional industries program producing hardwood flooring, and has a call center operation that employs 15 other offenders. Inmates at Kershaw Correctional Institution provides necessary dental and medical treatment onsite. Offenders can also participate in substance abuse group therapy and religious worship services. A pre-release program at this facility helps prepare inmates for discharge. Another unique program at this facility is called "Operation Behind Bars" which teaches adults and at risk youths who tour the prison about life inside of prison, and the consequences of criminal behavior. Visitation at Kershaw Correctional Institution occurs on Fridays from 3:30pm-6:30pm for all inmates, and on an alternating schedule based on the inmate's last name on Saturdays and Sundays from 8am-12pm and 1pm-5pm. Because the schedule alternates you will need to contact the facility at the telephone number provided to verify the current visiting schedule rotation.